BlueMountain Capital Management’s reputation has only grown since co-founder Andrew Feldstein’s successful 2012 bet against JP Morgan’s infamous London Whale, Bruno Iksil. 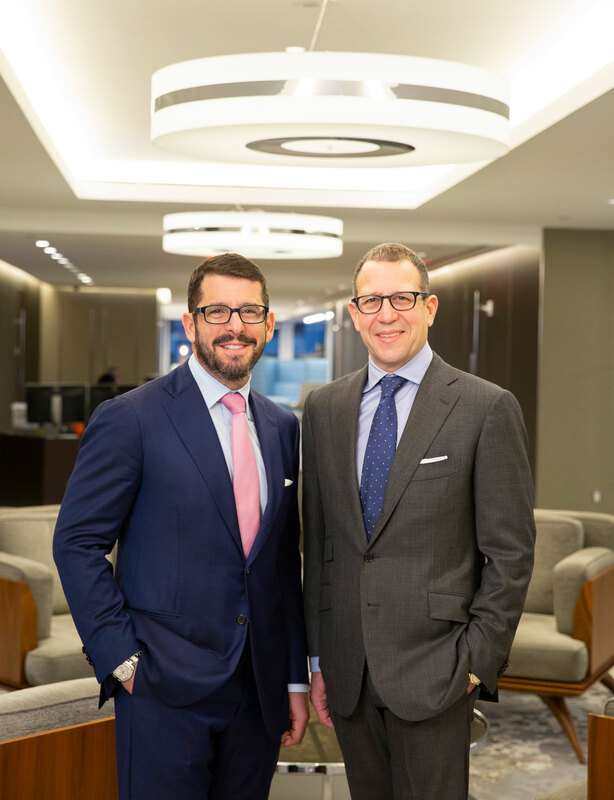 As the firm marks its 15th year in business, Feldstein and fellow co-founder and Harvard Law School classmate, Stephen Siderow, are putting the finishing touches to an ambitious multi-year expansion and evolution of the firm’s offerings. “One of our core strengths has always been our ability to evolve and expand investment strategies to attempt to take advantage of changing markets and new investment opportunities,” says Siderow, who is also co-president of the firm with Michael Liberman. The firm’s first non-credit strategy – volatility trading, across multiple asset classes – was launched just a year after it was co-founded by Feldstein and Siderow. Over the past two years BlueMountain has hired dozens of senior investment professionals to expand its offering of strategies covering its more than $20 billion under management. New offerings include global governments, municipals and agency mortgages as well as private investing in infrastructure. (L-R) Stephen Siderow (Co-President) and Andrew Feldstein (CEO & CIO), Co-Founders of BlueMountain Capital Management. The firm has also augmented its New York and London-based teams managing existing strategies that cover: fundamental discretionary equity; systematic equity; hybrid credit; structured equity; fundamental credit; distressed and special situations; and private investing in healthcare. “We’ve completed the majority of the heavy lifting needed for the expansion and evolution of our investment team and capital allocation process,” says Feldstein, who is also the firm’s chief executive officer and chief investment officer. “We’ve expanded and restructured some of our longstanding strategies and developed several new ones – all with a renewed commitment to our distinctive integrated culture,” he continues. At the same time, BlueMountain has invested in proprietary risk management and data analytics technology. Feldstein explains, “With our investment teams now fully staffed, we are accelerating capital deployment and taking advantage of what we believe is a more attractive investment environment for our style of multi-strategy investing”. “Another of our core strengths is bucket-busting,” adds Siderow. “While we have expertise in the sub-asset classes we focus upon, we also have a collaborative culture of cross-fertilisation among our strategies”. Team incentives encourage knowledge sharing. All staff can potentially receive discretionary bonuses based on team and firm performance. The only formulaic element of remuneration applies at the level of firm profits to partners. Staff also “eat their own cooking” by investing in the firm’s strategies. “… managers at BlueMountain insisted that all the investment ideas be put onto a common database. They also decided that the traders and analysts would receive a significant part of their compensation based not just on the individual investments they had worked on, but the results of the entire team and firm. This collaborative system was very different from the more common ‘eat what you kill’ model at most banks and hedge funds. Taken from The Silo Effect: The Peril of Expertise and the Promise of Breaking Down Barriers by Financial Times US managing editor, Gillian Tett. “There can be interplays between private and public markets, between credit and equity market expertise, between the discretionary and systematic equity teams, and between strategy and sector specialists,” says Siderow. The firm’s fundamental credit and distressed and special situations team, led by nine-year BlueMountain veteran Omar Vaishnavi is a good example of the firm’s bucket-busting approach. The team has grown over the last year with the hire of Rushabh Doshi from Hutchin Hill for the long-short credit strategy and new fundamental and distressed credit analysts. This year, Vaishnavi’s team identified several unique opportunities in utility companies thanks to insights from other portfolio managers. The firm also believes that there will be significant new opportunities arising from the collaboration of Vaishnavi’s teams with the global governments and agency mortgages team, headed by Colin Teichholtz and the private healthcare and infrastructure teams led by James Pieri and Scott Troeller, respectively. The firm’s systematic investing team, led by Perry Vais, a partner who is also head of quantitative strategy, has been exploring the applicability of its tools to augment decision-making by the fundamental discretionary equities team, led by Lance Rosen. The systematic investing team’s data science capabilities, in turn, have supported efforts by Vaishnavi’s fundamental credit team by providing access to retail corporate data to enhance their fundamental analysis and conclusions. A collaborative approach also entails peer review of investment theses. BlueMountain expects managers to follow a rigorous, structured and well-documented investment process. “If you cannot write down what you think, you do not know what you think,” says Siderow. Logged investment theses are also important for more qualitative performance appraisals, for which the risk and portfolio construction (RPC) team provides an independent input. “Losing money on an investment due to risk factors, such as asset class basis risk, that were flagged when the investment was made, means the loss has not invalidated the investment thesis,” says Siderow. The firm’s director of research, Michael Mauboussin, “brings rigour and structure to fundamental investment strategies,” says Siderow. Mauboussin is the author of several acclaimed books, including The Success Equation: Untangling Skill and Luck in Business, Sports and Investing. He and others “review, critique and stress-test investment memorandums,” says Siderow. BlueMountain’s talent pool has widened from the founders’ personal networks to lateral hires from other asset managers and more quantitative professionals but the one constant in recruiting has been a desire for cognitive diversity across many dimensions. Cognitive diversity “adds different perspectives, skill sets, and business models, and is valued amongst both our investment professionals and our business management teams,” says Siderow. The firm’s quant contingent, for example, is complemented by others who have studied liberal arts. Siderow’s undergraduate degree was in philosophy and Feldstein read economics. Consilience – the overlaps and insights across academic disciplines – is also at the heart of the firm’s “no silos” approach to investing. Feldstein is on the board of the Santa Fe Institute, a leading centre for multi-disciplinary research in complex systems theory. Michael Mauboussin is chairman of the Institute’s board. “BlueMountain has no specific targets for diversity metrics, such as the percentage of women in particular roles, but has policies and procedures that are very talent friendly and flexible in attracting top people, who are often women,” says Siderow. Several BlueMountain executives have been featured in The Hedge Fund Journal’s “50 Leading Women in Hedge Funds” reports, produced in association with EY. The 2018 survey included Cappiello and Amy Wierenga, chief risk officer. The 2017 report featured Sarah Dahan, head of global volatility and a senior portfolio manager and Marina Lutova Meyers, now with Citadel. Other senior women at BlueMountain include: Louisa Church, CEO of Europe and head of client advisory services; Dava Ritchea, CFO; the head of fund accounting and the deputy chief compliance officer. Wierenga, Dahan and Church are also three of the firm’s 14 partners. BlueMountain retooled its fundamental discretionary equity strategy, first launched in 2010, by shifting from a generalist approach to a team of sector specialists reporting to Rosen, formerly of Perry Capital Management, who joined last year. This year the firm hired four sector specialists as portfolio managers while internally promoting one more: Daniel Bae in risk arbitrage, who joined from Pentwater Capital Management; Sanket Patel in global energy, who was hired from Alyeska Investment Group; Mahmood Reza in global financials, who was brought in from Omega Advisors and Nitin Dewan, who was recruited from BlueMar Capital to manage primary strategies. Jared Gould was internally promoted to manage global industrials. The firm has also invested heavily in technology for its data and quantitative analysis capabilities since the 2015 launch of a systematic equity strategy that makes shorter-term investments across a larger universe of stocks. The systematic strategy, led by Vais, is beta neutral, but the discretionary strategy has latitude to take a net long or short stance. “The discretionary equity team takes views on companies and runs a concentrated portfolio of about 15 to 20 long positions and 20 to 30 short ones, whereas the systematic portfolios derive signals from large data sets and are diversified across hundreds of stocks,” explains Siderow. As the number of publicly listed US companies has continued to drop, BlueMountain has adapted by adding and then expanding private market investment capabilities over the last few years. Pieri’s private healthcare team has made more than $500 million in privately negotiated and structured investments across the capital structure in healthcare in recent years. These have included investments in post-acute and long-term care, behavioural health, acute care and physician practice management companies. The firm hired Ameya Agge from Apax Partners and Matthew Jameson from Highland Capital Management over the summer to source, evaluate, and execute healthcare-related private investments. In August the firm hired Troeller from Fir Tree Partners for infrastructure-related private investments with an initial focus on energy, environmental, and telecommunications infrastructure in North America. The risk limits of funds are ingrained into the culture of the firm. A trade looking really attractive is not a good reason for a risk exception. In February, BlueMountain hired Teichholtz from Pine River Capital to head a global governments and agency mortgages strategy. He leads a team of four portfolio managers covering G7 government, emerging market government and municipal debt as well as agency mortgages. Portfolio managers Phil Hermann and Andrew Seiz, who are managing relative value US agency mortgage-backed securities and emerging markets strategies, respectively, joined Teichholtz’s team from Pine River. Also joining the team were Morgan Alcalay, previously a rates trader at Barclays, and Evan Boulukos, formerly a municipal bond trader at Citibank. Clinching the talent to create this group was an opportune move. “The unwind of quantitative easing is expected to create more anomalies as central banks offload asset purchases,” says Siderow. “As bank proprietary desks have largely disappeared, there is less capital chasing strategies such as traditional fixed income arbitrage approaches, including relative value yield curve trades for government and agency securities,” he explains. Higher and more volatile US interest rates could also generate more gyrations in prepayment rates – how fast borrowers repay mortgages, another variable that Teichholtz’s team will be watching. The normalisation of market volatility, which may have begun in 2018, could also create more opportunities for trading emerging market sovereigns. Many emerging market countries have interest rate cycles that diverge from those of the US and other developed markets. US municipal bonds have different drivers from other fixed income markets. “The municipal strategy seeks to earn a premium from providing liquidity to smooth out supply and demand mismatches,” says Siderow. “These arise because the supply is driven by municipalities’ need to raise funds, while demand is more driven by the tax planning and compensation cycles for higher income groups who benefit most from the tax exemptions on muni coupons,” says Siderow. BlueMountain’s largest sub-strategy by assets is the collateralised loan obligation (CLO) business, which the firm launched in 2005. Brandon Cahill and Charles Kobayashi lead a team that manages more than $7.5 billion in CLOs. Over the last year, the team has added four research analysts in New York and London. Cahill believes “recent market growth and new entrants will lead to secondary trading opportunities during the next bout of market volatility.” He notes that “supply demand dynamics between CLO and loan issuance has led to spread compression between assets and liabilities, creating challenges for managers who need to satisfy third party CLO equity investors’ demand for large projected cash flows.” As a result, some managers have to “defend portfolio spread by going down the liquidity and credit quality spectrum,” he explains. BlueMountain “combines fundamental and structuring expertise when pricing CLO bonds,” he adds. BlueMountain’s volatility strategy, which dates back to 2004, has demonstrated longevity in a remarkably transient space where some other managers haven’t survived. Sarah Dahan, a partner and head of volatility based in London, trades volatility globally and across asset classes, in line with the firm’s ethos of finding opportunities between and among market silos. Dahan sees relative opportunities between Asian and US volatility. “There has been a healthy issuance of structured products in Asia ex-Japan that has contributed to a suppression of long-dated volatility,” she says, predicting, “A continued sell-off in Asian equities could lead to a better performance of Asian volatility”. In line with its “bucket-busting” philosophy, BlueMountain’s risk management is integrated with portfolio construction. “It’s natural to combine the two given that inputs around quantitative analytics, volatility and correlation feed into portfolio construction,” explains Siderow. As CIO, Feldstein makes the ultimate decisions on investments, based on inputs from portfolio managers and recommendations from the risk and portfolio construction (RPC) team, led by Wierenga. Illiquid or high-conviction liquid investments up-sized beyond their normal weight require investment committee approval. The input that BlueMountain’s risk team has in deciding the appropriate size of allocations renders somewhat irrelevant the classic risk due diligence question: can you veto and have you ever vetoed an investment decision? Wierenga “cannot recall any recent example” where a disagreement couldn’t be resolved in a way that required escalation to the firm’s Risk Committee, whose mandate includes ultimate resolution of disagreements between the risk-taking and risk-managing functions. Consistent with the firm’s ethos of “no-silos”, risk management is not split into buckets by asset class or strategy. “There is one risk philosophy and decision-making framework applied across all capabilities to provide an independent and separate analysis and viewpoint for portfolio managers in their daily jobs, using shared data, reporting and information,” says Wierenga. The firm has invested heavily in proprietary analytics. “Portfolio managers are very skilled at thinking about how to compare investments and size them within verticals, but multi-strategy hedge funds also need to compare and size positions across areas of expertise,” she says. “A common quantitative language is used to view investments through a consistent lens, discuss these issues and make comparisons throughout the firm,” explains Wierenga. “Of course, different teams will have a diversity of opinions on the relative attractiveness of investments, and this type of frictional dialogue is welcome”. Whilst there is a healthy discourse within the firm, some things are non-negotiable. “The risk limits of funds are ingrained into the culture of the firm, a trade looking really attractive is not a good reason for a risk exception,” says Wierenga. BlueMountain’s unwinding of JP Morgan’s gargantuan London Whale trade in 2012, for example, was consistent with risk limits “because of how we structured the trade,” she continues. “We could assume a large notional position because there was no longer any basis risk in the trade, so we were not exposed to further technical dislocations”. BlueMountain sees a long runway of growth ahead for the alternatives industry. Feldstein believes $3 trillion is much too small for total hedge fund industry assets. “Alternatives make up such a small percentage of total asset management industry assets, that the industry could grow much bigger and remain a small part of the overall asset management industry,” he says. Some alternative asset managers have grown by launching more scalable long-only strategies. BlueMountain has seldom done so in relatively liquid markets, though its private markets strategies are inherently long-only.